Yesterday was a make-or-break session for the preferred S&P 500 (SPX) wave count of an ending diagonal, and today offers similar potential. 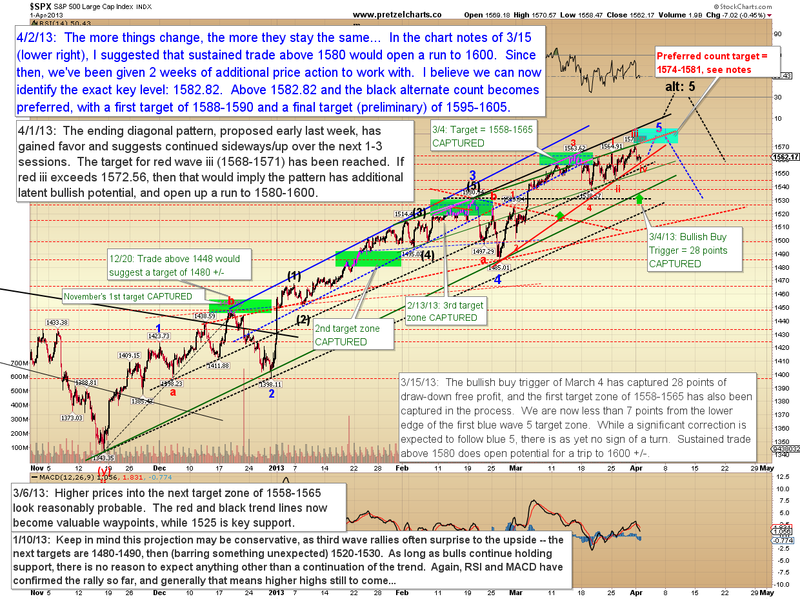 Heading into Monday's session, wave iii had a short-term invalidation level of 1572.56. The market not only reversed about two points shy of the stop, but then moved down to perfectly break the trend line which "needed to be broken." 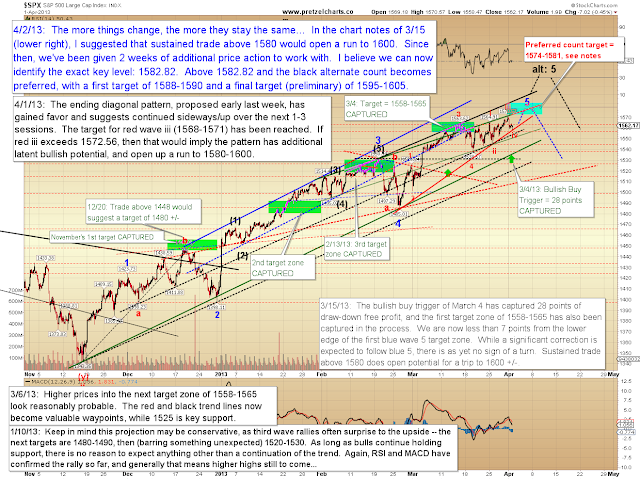 Thus this wave count gains a bit of confidence and continues forward. The 10-minute chart below is almost unchanged since 3/28, as the market has tracked the projection exceptionally well since. For short-term trades, this has provided a few excellent low-risk entries, with clear stop levels along the way. It can be very tempting to get cocky after the market follows a projected path this well -- but these are exactly the times to be cautious as a trader. I can't tell you how many nights I've scalped a string of eight or more consecutive wins, only to grow too big for my britches and give back half my night's profit on one bad trade. Just as life does, the market has a way of quickly humbling the proud; so moderation and discipline become the keys to lasting success. So often, after we achieve success, we become proud and careless -- but in so doing, we forsake the very qualities which brought us success in the first place. Failure is bound to be the result. At times we seem unable to recognize that we are rising and falling on our own endlessly repeating inner cycles: We fail, so we decide to buckle down and work harder; then we work harder, which allows us to achieve success; then, after we achieve success, we become proud and careless again -- so we lose our hard-earned success only to find ourselves right back where we started. Rinse and repeat. I've known a lot of traders (and beyond), myself included, who have fallen into this trap at times. I believe one key to trading is to learn to act in accordance with the times, and to recognize that sometimes doing nothing is actually the most productive thing we can do. Trying to plant crops in frozen ground only wastes precious resources -- so avoid the trap of needing to "constantly be part of the action." We can gain a great deal of understanding by learning to recognize not only the cycles of the market, but also the cycles of our own tendencies. And many days, the opponent we're trying to overcome isn't outside of us at all. I've said it before: I believe our biggest opponent in trading, and the hardest one to beat, is ourselves. We currently have a pattern that appears reasonably clear -- and we also have some key levels to watch which will tell us where things become less clear. It's now anticipated that SPX will form another thrust up, to a new high. Ideally, I would like to see this rally break the upper red channel boundary (but this is not required), then reverse back into it and rapidly retrace toward 1540. We are again presented with a very clear stop level for near-term trades, since the diagonal as labeled is invalidated above 1582.82. 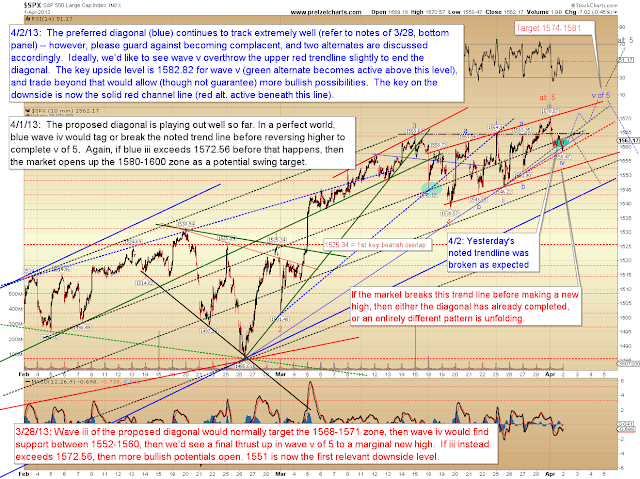 The hourly chart notes the targets of the more bullish alternate count if 1582.82 is broken. This level is key because wave v in a contracting diagonal cannot exceed the length of wave iii. Every now and then, diagonals are transposed slightly from the most obvious count -- in other words, the wave which currently appears to be wave iii could conceivably be an extension of wave i (a diagonal is "allowed" to have a wave which is a double zigzag; a double zigzag is two connected ABC's). That presently appears markedly less likely, but it is not entirely outside the realm of possibilities. In conclusion, the ending diagonal pattern has tracked quite well so far, now it remains to be seen if it will conclude with equal ease, or morph into something more bullish. Trade safe. I visit every day a few websites and sites to read content, except this weblog presents quality based posts.